As if the peace movement hasn’t enough on its plate already, the military-industrial complex goes and invents a new and easier way to wage war: the unmanned drone. 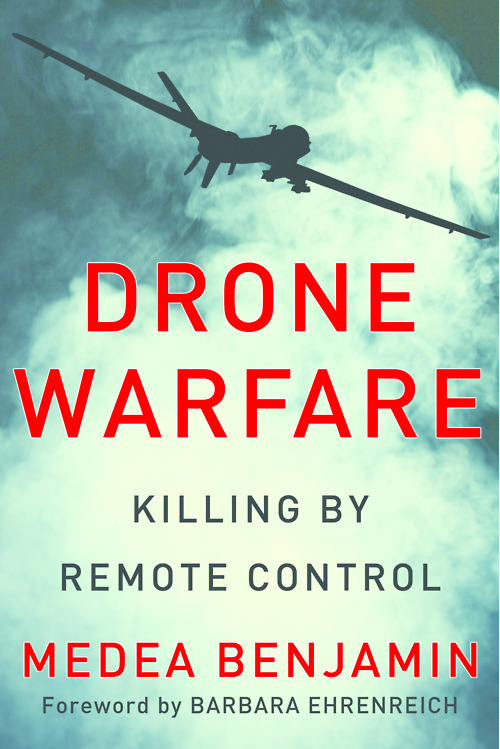 For the busy activist trying to grapple with the growing development of the drone wars, what’s needed is a well-written, easy-to-read book, coming from a committed nonviolent perspective, that lays out the issues in an accessible but not simplistic way. Thankfully, long-time US peace activist, Medea Benjamin, has written the very thing: Drone Warfare: Killing by Remote Control. Benjamin teases apart the varying overlapping issues connected with the growing use of drones (or Unmanned Aerial Vehicles as the military insists on calling them). Individual chapters explore the birth and growth of the industry as well as their spreading use in armed conflicts from Gaza and Afghanistan to Yemen and Somalia. The legality of their use is also investigated, in particular their use for so-called ‘targeted killings’ and their impact on civilians in Pakistan and elsewhere. Unmanned drones seemingly give the ability to launch armed attacks at great distances with no risk or cost. Benjamin demonstrates that this is a lie on many levels. For example she tells the story of an attack launched by a drone pilot in his Nevada base on a group of insurgents standing around a truck thousands of miles away. Just as the missile is launched, two kids on a bicycle suddenly appear. Benjamin goes on to quote US major Bryan Callahan saying that drone pilots are taught ‘early and often’ to compartmentalise their lives, to separate the time they spend firing missiles on battlefields from the time they spend at home. This is perhaps the essence of the problem. The idea that we can separate ourselves off (at the personal and political level) from the economic, political, moral and human consequences of our actions has been taken to a new level by this new way to wage war. The book concludes by looking at some of the initial efforts of the US and European peace movements to respond to the rise of the drone wars. This book will, I am sure, encourage and enable more people to take further action.